Lawrie's Garage general manager Craig Anderson presents Selkirk RFC junior vice-president Rob Forrest with the 2015 sponsorship cheque, watched by members of the Lawrie's sales team. Standing, from left - Allan Ralston, Keith Brocklehurst, Rob Forrest, Craig Anderson (general manager), Chris Barton, George Mack, David Henderson (sales manager). Kneeling ' Selkirk players Ewan & Craig MacDougall. The build-up to the 2015 Selkirk Sevens moved up a gear last week, following a cheque presentation to the club by tournament sponsor Lawrie’s Garage. Part of the Border Motor Group based in St Boswells, Lawrie’s Garage is supporting the tournament for the third successive year. Selkirk Sevens tournament at Selkirk. Selkirk vs Melrose in the final. Last Thursday at the company’s St Boswells headquarters, Lawrie’s general manager Craig Anderson presented a sponsorship cheque to Rob Forrest, Selkirk RFC’s junior vice-president. The Kings of the Sevens series to date has seen the emergence of Gala as this year’s prime contenders and Saturday’s tournament is sure to see another quality performance from young George Graham and his squad. The Maroons have certainly impressed Selkirk Sevens convener and former Scotland international John Rutherford. “Gala have played some great sevens and seem to have good strength in depth in their squad,” he told The Southern. Gala are fully deserving of their three tournament wins and their lead in the Kings of the Sevens table. However, Melrose, with their fifteens programme completed, have shown what a class outfit they are by winning both tournaments last weekend. Both clubs are in opposite halves of the draw and would be favourites again to make the final. It’s up to the other clubs to lift their performance levels and make a challenge. Jed, with Fraser Harkness and the Young brothers, are very capable of winning a tournament, as are Hawick, as they proved at Langholm. 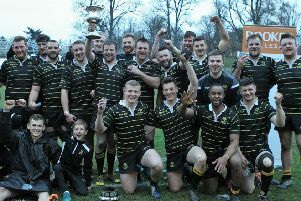 Heriot’s, Watsonians, Kelso and Edinburgh Accies all have the potential to do well, as do Selkirk, who always seem to raise their game at their own tournament. Finally, it will be interesting to see how Loughborough, coached by former Selkirk player Ciaran Beattie, perform. Older supporters will remember the outstanding Loughborough team of the 70s who won several Border tournaments. “We hope it is another good tournament enjoyed by all the participating teams and supporters,” added Rutherford. The Selkirk Sevens tournament, sponsored by Lawrie’s Garage, takes place at Philiphaugh on Saturday (first tie 2pm).